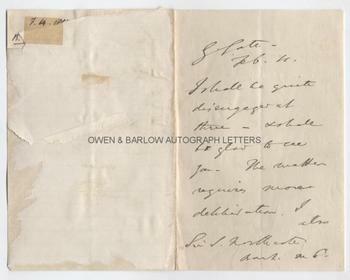 BENJAMIN DISRAELI AUTOGRAPH LETTER SIGNED. ALS. 2pp and integral blank leaf. G[rosvenor] Gate. February 4th . To Sir Stafford Northcote. 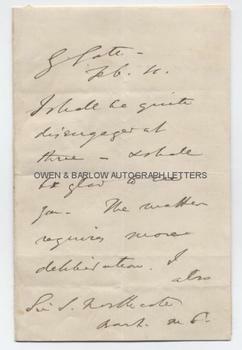 "I shall be quite disengaged at three - & able & glad to see you. The matter requires more deliberation. 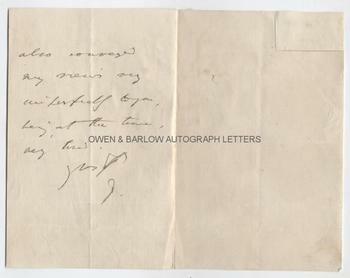 I also conveyed my views very imperfectly to you, being, at the time, very tired." Signed with initial 'D'. 8vo. Approx 7 x 4.5 inches. Docketed on verso (partially obscured by paper backing) "7.4.1866. B. Disraeli." The verso of the integral blank has been backed onto paper and has some old mounting damage. The text leaf, however, is in very good undamaged condition. In Lord Derby's third government of July 1866, Sir Stafford Northcote became President of the Board of Trade and sided with Disraeli (who was Chancellor of the Exchequer) on questions of reform. In January and February 1866, a period of Conservative opposition, the Reform Bill was being hotly debated and it is possibly this question that was occupying the minds of both. When Disraeli formed his second administration in 1874 it was Sir Stafford Northcote who he appointed as Chancellor.